One to Ten: Squirrel’s Bad Day is a fun storybook for children, as well as providing a coping mechanism for learning to deal with problems. Ranking a problem on a scale of one to 10 will help them to understand that bad things happen and, when you compare them to other problems, maybe some of them aren’t that bad. This educational children’s book by Carole Roman will help children to understand their problems and to realize that maybe some problems are small—less than 5 on the scale—and shouldn’t bother them at all. 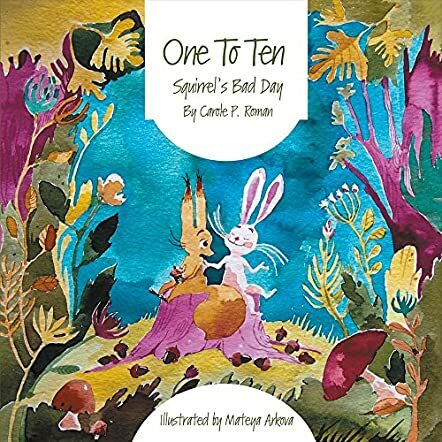 One to Ten is a wonderful story of Rabbit explaining to Squirrel how the ranking system helped him to cope when trouble happens. Squirrel was feeling sad when he dropped his acorns into the stream, but with Rabbit’s trick, he doesn’t feel so bad. Rabbit shares some examples of problems that happened recently and demonstrates to Squirrel how to rank those examples. Rabbit also explained how sometimes good things come from problems. In the end, losing some acorns in the water doesn’t seem as bad when you rank it on a scale of one to ten. I think parents and children will find this story entertaining and educational. The beautiful watercolor illustrations by Mateya Arkova are well done and add so much to the story. The use of tones and shadows is very effective for children’s book illustrations. I like the divided page technique used on some pages, just like a graphic novel. I also liked the talk bubbles with shadows like a comic book and the fun, whimsical drawings of animals dancing or cheering.